The conference is intended for foreign companies doing (or considering to start) their business in Russia. In recent years, Russia has been undergoing rapid systemic changes, which are sometimes very difficult for foreign entrepreneurs or investors to understand. Each stage of business development in the Russian market is characterized by its own risks, which foreign companies need to be aware of in order to conduct successful business activities. 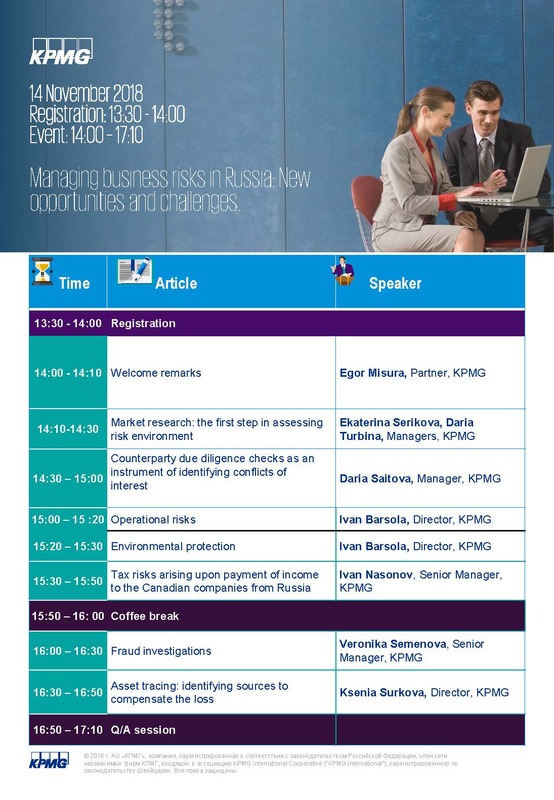 At the conference, KPMG experts will talk about how to identify these risks and minimize their consequences. We would like to express gratitude to KPMG for hosting and sponsoring the event! Admission - free, by guest list only. If you have any further questions, please contact Svetlana Kondrashina-Scott at Svetlana.Kondrashina@britishclub.ru or +7 916 651 4048.